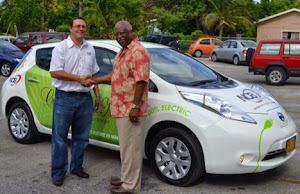 GEORGE TOWN, Cayman Islands — The NCB group in the Cayman Islands has purchased the very first new all-electric Nissan LEAF in the Caribbean, reinforcing its commitment to environmental sustainability. “NCB Group is proud to be a part of the innovative movement towards electric cars in the Cayman Islands,” said Matthew Wight, managing director. Considered the premier residential developer in the Cayman Islands, the NCB group is seeking to further reduce its ecological footprint in an effort to protect the Caribbean and the planet from harmful greenhouse gasses. Wight said that he drives electric vehicles because he knows that he is helping the environment. “As a company, we strive to employ sustainable and green technologies when we build our residential and commercial projects and we wanted to carry this mission through to the vehicles we drive,” he explained. Driving a Nissan LEAF – a 100% electric car — has been extremely rewarding “in the sense that the LEAF does not use a single drop of gas. It has no tailpipe, no fumes and produces zero emissions,” he said. “As we build with Cayman’s future in mind we are also looking to alternative energy sources in everything we do with the goal to be as eco-conscious as possible,” Wight added. For nearly a decade John Felder, president and CEO of Cayman Automotive Leasing, has been at the forefront of the burgeoning electric vehicle industry in the Caribbean. His hope is to see electric vehicles being driven in every country in the Caribbean and eventually the world in years to come. “I applaud Mr Matthew Wight and NCB for investing in the future for a cleaner and healthier environment. The energy generated to power the Nissan LEAF and the energy to move the car is 97% cleaner in terms of noxious pollutants,” Felder said. The Nissan LEAF boasts one of the quietest and smoothest rides ever experienced. The vehicle does not have a gas tank and drivers will never have to pay at the pumps again. The motor is powered by an advanced lithium-ion battery, which is half the weight and twice the power of the nickel-metal hydride batteries used in hybrids, and can easily be charged at home, or at any solar panel charging station in Grand Cayman. Felder is certain that electric cars are the cleanest, most efficient, and most cost effective form of transportation around.